One of the things I love about Thanksgiving and celebrating healthy holidays is recipe makeovers. Need a healthy stuffing recipe? Check! How about a healthy stand-in for mashed potatoes? Check! Healthy cranberry sauce without sugar? Check! Dinner rolls sans-gluten to slather ghee on? Check! How about healthy dairy-free pumpkin pie? Check and check! Let's face it, holidays are an excuse to eat unhealthy food only if you want them to be. While I strive to be a humble person, I have to admit I always feel a bit smug when I can transform a recipe from unhealthy to healthy. Whether that means getting rid of toxic sugar, dangerous glutenous grains or processed carbs, it's a challenge I am always up for. In fact, if you have a holiday recipe that needs a healthy makeover, send it my way, I'll see what I can do. Yesterday while I was working at my treadmill desk, I got an e-mail from Whole Foods with a holiday recipe that called for my favorite seasonal low-carb fruit, cranberries. I love cranberries so much, I keep my freezer stocked year round with these antioxidant-rich little red gems. A tip from me to you…at the end of the holiday season, when you see cranberries on sale, buy them and toss in the freezer. They keep for 12 months and no need to thaw when used. The aforementioned recipe was called “Sugared Cranberries” and simply called for cranberries, water, sugar, cinnamon and cloves. Sounds simply enough to transform, all I needed to do was nix the sugar. 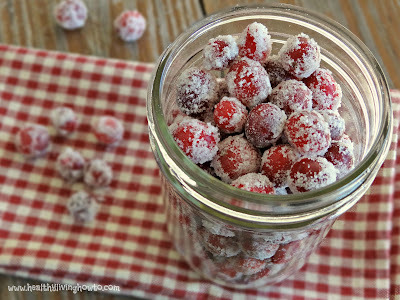 Can't say I've ever had sugared cranberries before, but my healthy version, which I am calling Not Sugared Cranberries, are easy to make, both sweet and tart, fun to eat and slightly addicting. Do you love cranberries as much as I do? What are some of your favorite ways to use cranberries? Leave a comment, my inquiring mind wants to know! In a medium saucepan over medium-high heat, bring to boil water, stevia, cinnamon sticks and cloves. Place cranberries in glass canning jar and pour boiling water over top. Seal jar, bring to room temperature then refrigerate overnight or 8 hours. To bottom of glass pie plate add 1/2 c. erythritol or xylitol, add cranberries about 1/4 c. at a time. Shake to cover and remove with slotted spoon to parchment lined baking sheet. Dry at room temperature for 2-3 hours then transfer to sealed container.